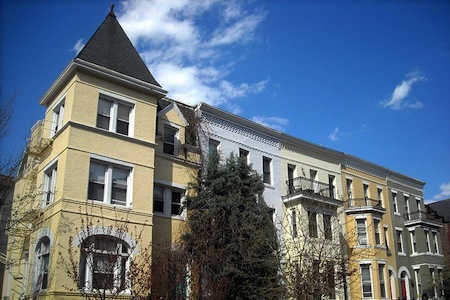 Rowhouses on N Street in Washington, D.C., a few blocks away from Dupont Circle. James Srodes is a veteran journalist in Washington, D.C. He joined United Press International's Washington bureau in 1967 and has written for various publications during the subsequent forty years, including Business Week, Forbes, Financial World (the latter two as bureau chief), and The Sunday Telegraph. He is a regular contributor to the American Spectator, the Washington Times, and comments on the radio for the BBC World Report. 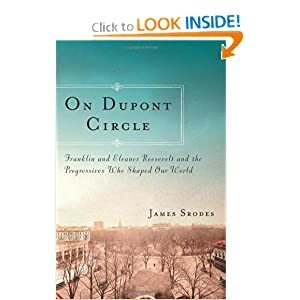 Srodes is also a biographer of prominent American politicians, including Benjamin Franklin and Allen Dulles. His latest book is On Dupont Circle: Franklin and Eleanor Roosevelt and the Progressives Who Shaped Our World. I sat down with Srodes at a cafe just off of Dupont Circle to talk about his book and Washington, D.C. Yes, it's where it begins. They don't stay here, but this is where it begins. The book begins in 1916, the year before America enters World War I, and Washington in those days was a much smaller town, and much more segregated by function, at least as far as government employees and their families were concerned. If you had business with the Congress, you tended to gravitate to the boarding houses and hotels and apartments near Capitol Hill. If, however, you worked at the White House or what is now known as the Eisenhower Executive Office Building, the big Second Empire monstrosity formerly known as the State Navy and War Building, you lived in Dupont Circle. Down on N Street was the house loaned to “Frank” and Eleanor Roosevelt, as they were known in those days. He was the assistant secretary of the Navy. It was loaned to him by his cousin because he didn't have any money -- the Roosevelts never had any money. They may have been from an old family, but Franklin Roosevelt was always strapped for cash. Around the corner on 18th Street was a big mansion that was a multi-family home. A general named John Watson Foster, who had been a secretary of state, owned the house. His son also lived there, and one of his sons-in-law, Robert Lansing, who was the secretary of state under Woodrow Wilson, and three of General Foster's grandchildren by another daughter -- John Foster Dulles, the future secretary of state, Allan Dulles, the founder and longest serving director of the CIA, and Eleanor Dulles, who would go on to become a world-class economist. They lived in the same boarding house? Yes. And two British noblemen named Eustace Percy and Philip Carr, because the British embassy in those days was on Connecticut and R. All these people were in their twenties (or, at the oldest, their early thirties) and they were in and out of all these houses, but mostly the house on 19th Street, which became known as the “House of Truth.” It was given that name by Oliver Wendell Holmes, the Supreme Court jurist, who was a major talent-spotter for the progressives. He served as kind of a den father for this collection of young, elitist progressives who were coming here to make their careers. And he called it the “House of Truth” because, he said, these are the fastest talkers and brights minds in Washington. And so they drank the new cocktail called the daiquiri, they danced to jazz on the Victrola, they smoked furiously, and they stayed up all night arguing what it meant to be a progressive. Which is not a word you typically associate with Franklin Roosevelt. This was before the polio crippled him? Absolutely. He was young, he was movie-star handsome and athletic, and by that point in time had begun to have affairs, most chiefly with his wife's social secretary Lucy Mercer, who lived on P Street. Among the other people who came by was the man who represented the beau ideal, who represented everything that progressivism found attractive. Remember that this was a political philosophy whose religion was science, data, and facts. It had replaced organized religion with the certainty that if you had adequate data, all answers were clear. And this was a man who became an orphan, never had a high school diploma, became a famous mining engineer, fought Chinese bandits, made a fortune, retired wealthy, and saved Belgium from starving in the first year of World War I. His name was Herbert Hoover, and everybody loved him. Now, Hoover wasn't a likeable person -- he was very ill at ease, he was very easily bored, he was dogmatic, but he got things done. He was brought back by Wilson to run the food rationing program, which he accomplished without forced rationing. He saved thousands and thousands of tons of food for the Army. To Hooverize became a common phrase for doing something more efficiently and successfully. In 1920, he was so beloved that Roosevelt begged him to run for president as a Democrat, and that he, Roosevelt, would run as his vice president. Hoover's great flaw was that he hated politics, and he hated politicians. If you could have anointed him president, he would have been perfectly happy. He didn't know how to do that retail give and take, which you have to be able to do with a fractious Congress, with always-changing public opinion... He didn't know how to do that. All he knew was the “truth.” And the truth ought to be enough for everybody, but of course the “truth” isn't enough for everybody. Absolutely. So that's where it begins. They all end up in Paris at the 1919 Paris Peace Conference, where they're thrown together for six months -- there never was an international conference before, nor would there be one since, in which men and women in their twenties and early thirties had so much power. Everybody talks about Lloyd George, and Wilson, and Clemenceau, but they couldn't have made their decisions without the staff work of these young people, who got to know each other intimately. They drank with each other, they chased girls, the French pulled their champagne from out of their cellars, there was the arrival of jazz in Paris. They just had a wonderful time. But at the end of it they realized it wasn't going to be the one-size-fits-all solution. Percy and Carr had become the chief foreign policy advisors for Lloyd George -- along with John Maynard Keynes. All of them got together at the very last week of the conference and agreed to set up a trans-Atlantic conversation, and out of that stemmed, in London, something called the Royal Institute of International Affairs, otherwise known as Chatham House, and in New York it became the Council on Foreign Relations. And those two entities are still the most important formative organizations for foreign policy theory today. The Dulleses were involved, Lippman was involved, Frankfurter was involved, Percy, Carr, Hoover -- all of them. What my book is about is the next twenty years -- 1919 to 1939. They all go off, they all have their own lives, they all have sexual escapades, they drink too much, they smoke too much, they swap wives. At the end, Roosevelt does a very daring thing. In 1939, we're not in the war. He commissions a secret study group to plan post-war American foreign policy, because whether we're in the war or not, we're going to emerge as the dominant power. It had to be secret because the isolationists would have gone absolutely ape and, again, it started at the Council on Foreign Relations. It became the outline for the Atlantic Charter that Churchill and Roosevelt signed in 1942, and in that Charter one of the mentioned objectives is the creation of the United Nations. Sumner Welles, the undersecretary of state, was at the center of this. Welles, when sober, was the most talented diplomat in twentieth-century history. When he was drunk he was a predatory homosexual who preyed on working-class people -- he was a time bomb waiting to explode. The episode where he was most egregious comes, just literally, two months before the 1940 election. The only sin you could commit was to get a divorce. There was a very strict dividing line between an individual's public career and his private life. Allan Dulles, for example, was a serial philanderer -- he could never be the CIA director today. So was Franklin Roosevelt -- not only with Lucy Mercer, but with one of his secretaries, with a whole host of other women -- could never have been a multi-term president today. As for Sumner Welles, remember, homosexuality in the '30s and '40s was a felony in all forty-eight states. You could go to jail for a consensual sexual act. What he did was -- the Speaker of the House, William Bankhead, died in September 1940, and Roosevelt chartered two trains to go to the funeral in Alabama, and he took his entire Cabinet and much of Congress and most of the press corps with him. When they got back on the train after the funeral, everybody got drunk, and Sumner Welles tried to seduce not one, but five Pullman car porters, to the point that the Pullman car waiters and porters called the Secret Service. It was a scandal that, first of all, could have led to police charges, but it certainly should have led to his immediate resignation. Yet Roosevelt kept him on -- he needed him desperately. If there's a villain in my book, it's William Bullitt, who was a very talented diplomat, journalist, he was our first ambassador to the Soviet Union in '33, and then our ambassador to France just before the fall of Paris. He came back expecting cabinet rank, and when he was denied it he began to out Sumner Welles -- it was a bid to force Roosevelt to fire him so that Bullitt could take his place. All of this is happening in '41, '42, '43, and it could've wrecked everything. So why was Welles so valuable to the president? He was was brilliant, and he had been very creative in reversing America's awful reputation in Latin America. He was the author of the Good Neighbor policy, which essentially established kind of a loose, fractious commonwealth with very, very prickly Latin American governments. It was so successful that, despite tremendous efforts by German intelligence to make bases and inroads in South and Latin America, all of those countries stood by us in World War II. He also had a vision of what foreign policy had to be for the United States that buttressed Roosevelt's own intuition. There also was a very close personal bond -- Sumner Welles had been a boyhood friend of both him and Eleanor. So Roosevelt steadfastly refused, and even when Welles was forced to resign in '43, he continued to come to the White House as a private citizen, whereas Bullitt never saw Roosevelt again. So what eventually forced him out? Bullitt convinced the secretary of state, Cordell Hull, to threaten to resign. And, as I said, by this time it's '43, Roosevelt's looking ahead to the '44 elections. Well, Washington has always had salons, going back to the founding of the city. Dolley Madison ran a salon. There were famous salons during the Civil War and afterwards -- Washington was a small town of varying elites. What this was was less of a social elite and more of an intellectual elite. Today, people who say that they're progressives don't have a lot in common with these progressives. These progressives were less concerned with outcomes than with opportunity. They believed very firmly that a rising tide lifts all boats. So, among other things, they were not particularly sensitive to civil rights for African Americans or indeed other ethnic groups, because they felt that if the general prosperity was fair and equitable, then everybody would benefit. There wasn't any need to fine-tune. And there were many different kinds of progressives. There were women's suffrage progressives, prohibitionist progressives, the birth control movement progressive (who also morphed into eugenicist progressives), there were socialist progressives, communist progressives, a whole range. Whatever you were, you could be a progressive, if you subscribed to a couple of basic tenants. One was a belief in science and data could give you the solution to everything. That's Hoover. Give me the data, I'll give you the answers. Sociology moved from a university discipline to a public, government function, opinion polling became important. Look at the monster it is now. And so there were all sorts of economic nostrums and faiths and so on, but the central one was a belief in data and in the power of experts, of whom they considered themselves to be, to make sense of that data and prescribe social policy. So how does this color the career of, say, Walter Lippman? How did his incubation in Washington during this time influence his views later on? Walter Lippman's views changed dramatically over this twenty-year period. He started as a socialist. He very quickly became a pacifist progressive, then dropped that, too. He became a Wilsonian progressive and was an early backer of Franklin Roosevelt, but he voted for Alf Landon in 1936, only coming back around to Roosevelt thanks to the Atlantic Charter. And so he was a glorious case in point -- he marks the evolution in thought. To the second point [on what in meant to be a progressive], in addition to the faith in data, is this assumption of a new role for America in the world, which is the arbiter of democracy. We can show other nations how to organize themselves to be better countries and be better people and thus do away with the causes of war, and out of that comes the American duty to be the policeman of the world and to nation-build. I mean, Abraham Lincoln wouldn't have known what you were talking about if you said, “we're going to build nations.” Theodore Roosevelt REALLY didn't see our role as “making other countries better.” But starting with Wilson, going through Roosevelt, and on, it has become an assumed duty that now nobody questions. And two of the architects of this trend in American policy are the Dulles brothers, whom you wrote about. Absolutely. In World War I, at the Paris Peace Conference, John Foster Dulles, who was thirty, worked out the details of the war reparations that were being imposed on Germany with a young John Maynard Keynes, of the British Treasury. And he was the architect of the economic policy that followed, in which Wall Street loaned money to war-torn European countries to buy American products as a key to spurring the boom time of the '20s. Foster Dulles was a very complicated person. He became known as a legal expert, but people forget he was very involved with the World Council of Churches, the Christian progressive movement, along with Reinhold Niebuhr and people like that. Allan Dulles was, from 1916 on, a spy. He was a lawyer, but he was a delegate at all the peace conferences that we supposedly didn't attend. We were there at every meeting of the League of Nations, and usually our representative was Allan Dulles! At the advent of World War II, Allan Dulles and Foster Dulles were probably the two most well-known Americans in Europe. Later, of course, they became what they became, but they were always active in the Council on Foreign Relations. They were friends of Lippman's, and indeed Lippman ran off with the wife of the head of the Council on Foreign Relations, and Allan Dulles was the attorney who worked out the divorce! And speaking of that, a thought struck me. Students of military history often see connections between prominent American generals -- Eisenhower and Patton were close friends, for example, in the 1920s. This is really the civilian version of that story. Oh, absolutely. And remember the segregation-by-function -- there was the military community, there was the State Department community, there was the congressional community all the way down there. Did outsiders ever enter these communities? I mean, Hoover, it sounds like, was one of them. That was part of his problem -- he really didn't have a constituency here. He was an outside expert. But he never took the trouble to schmooze. He hated schmoozing. He hated backslapping and smoke-filled rooms. It just went against his grain. Hoover was the most successful secretary of commerce we've ever had. Think of the industries he helped to create: commercial aviation, commercial transportation, highways, radio, standards for products. He did all of that when he was working for Harding and Coolidge. So he was the inevitable president, but once he got to be president, he just sat down there in the White House. Nobody would listen to him. Not even the military [over the Bonus March]. Whereas Franklin Roosevelt was a natural politician. From 1920 on, made a card index file of every Democrat he met. So if you would write to him five years after you married, he'd write you back and ask about your wife and your children. It's interesting, the way that these associations were used as political weapons. Bullitt owed his entire political career to Franklin Roosevelt, but such was his jealousy -- I mean, he really was a yahoo, the way he used his intimacy with Roosevelt. At one point he was making love to Roosevelt's closest personal secretary, leading her on thinking he was going to marry her, in order to get inside Roosevelt's head, and Roosevelt really was furious at that level of betrayal. You can't betray somebody unless you're that close. It's not just a question of hedonism in these bedroom politics, then. Well, like today! There was a higher level of tolerance then, because a) the press didn't make it public, and b) unless it lead to the real sin of divorce, which was public, it never really intruded on their public lives. How has Washington culture changed since those days? It's much less stratified. There used to be old powerbrokers, old families of wealth, old senators and cabinet officers like John Foster, who went to work at the State Department every day of his life long after he had ceased being secretary of state. And now it's much more of a free-for-all, much more social mobility, but also much more anonymous. And, in many respects, much less influential over national events. The day is long gone when people like the Rockefellers could dictate who the Democratic nominee would be. I can't think Georgetown would ever have picked Barack Obama. But then again, political parties have changed. They're both going through a tremendous metamorphosis, hence the bitterness and the partisanship. Thanks so much for speaking with me today. Correction: An earlier version of this article incorrectly identified Bretton Woods as being located in Washington, D.C., near Dupont Circle. Dumbarton Oaks, site of the 1944 Dumbarton Oaks conference which led to the United Nations, is located in Washington, D.C.; Bretton Woods is in New Hampshire.